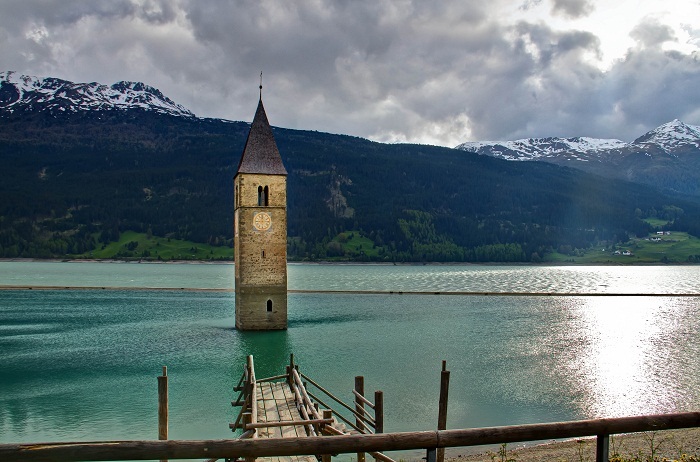 Reschensee Bell Tower is a medieval tower that stands in the middle of the Reschensee Lake, close to the Swiss and Austrian borders, in South Tyrol, Italy. 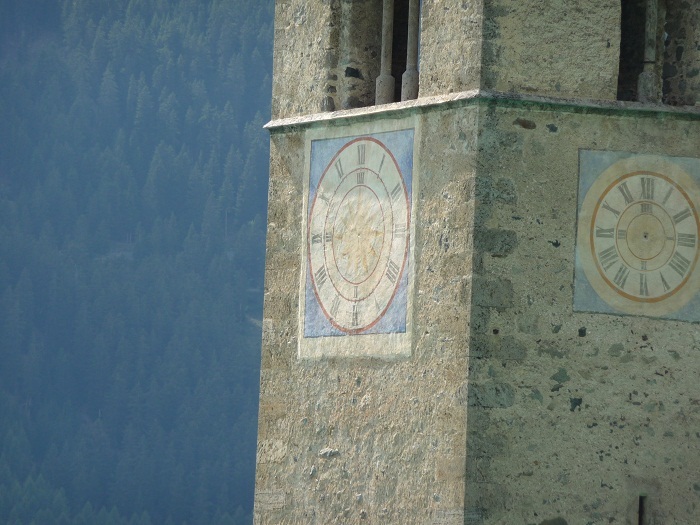 The Bell Tower was part of a church dating back from 14th century, and as many villages enjoyed anonymity and had a very peaceful life throughout the history. 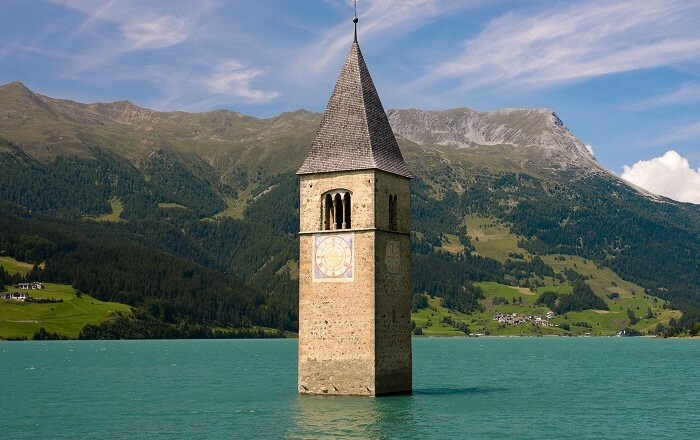 The story of the village of Graun, in which the church and the bell tower were located, was the same up until 1930’s when there were plans to build an artificial dam, so that there will be a better and increased electricity production in the region. 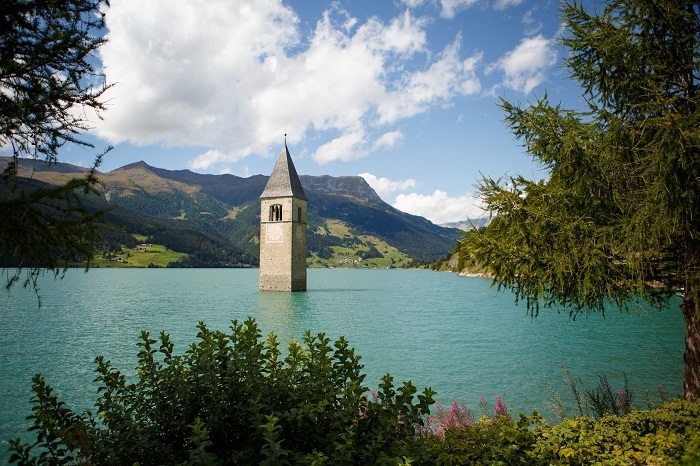 The first plans of the construction were in 1939, where it was publicly announced that the villages of Graun and Reschen would be completely and, respectively, partially flooded. Even though there was a resistance from the local population, the construction began in 1940 which took a decade to be completed. 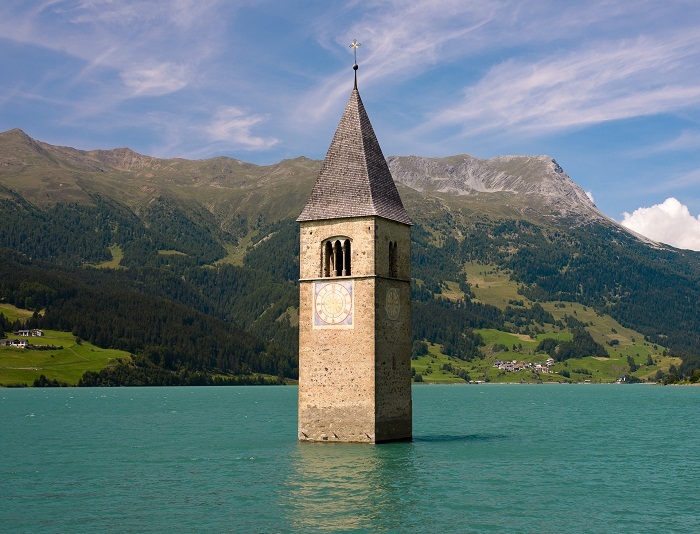 In the aftermath, the 22 m (72 ft) deep lake, two natural lakes, Reschensee and Mittersee, were unified into one and in total 163 homes were sunk below the rising waters. 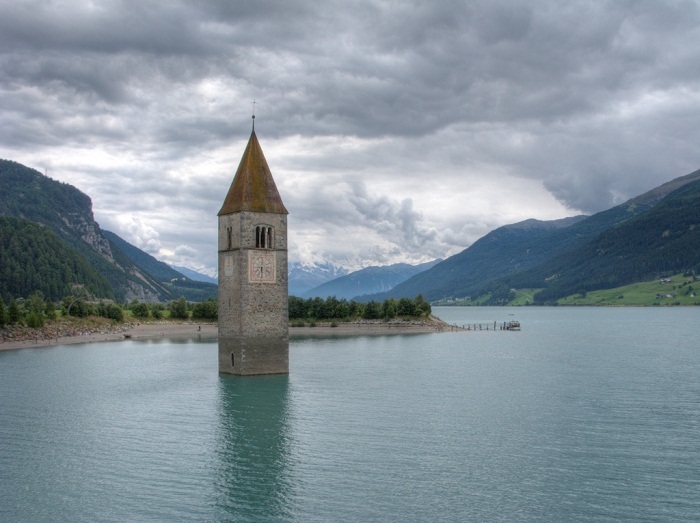 Before the water reached the villages, most of the buildings were demolished and the bells taken from the church tower, nonetheless, the bell tower was left to bear witness that once there stood a small community which enjoyed the gorgeous life of mountainous Italy. 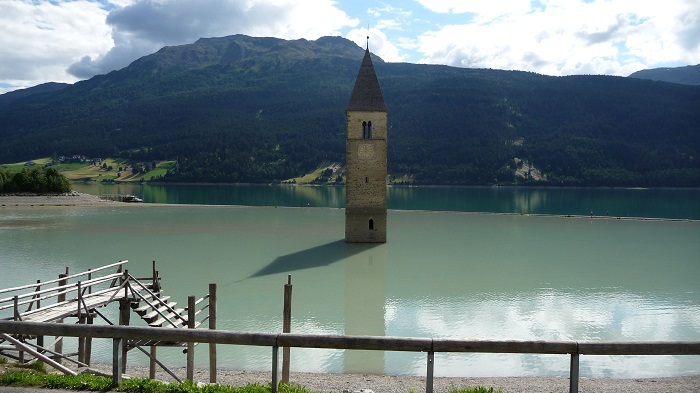 Montecatini , the company that built the dam, gave the families small amount of money for their homes, where some of them moved away, and some chose to stay and build a new life in Upper Graun where they still live today. 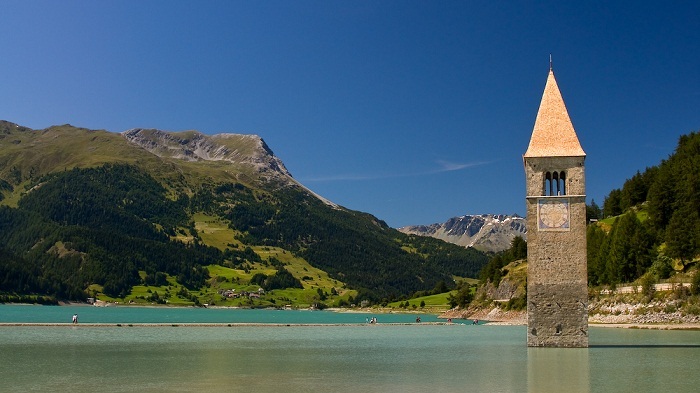 As one of the most known landmarks of Italy, many people are going to enjoy the gorgeous landscape and also to take as much photos as possible from this historic place. 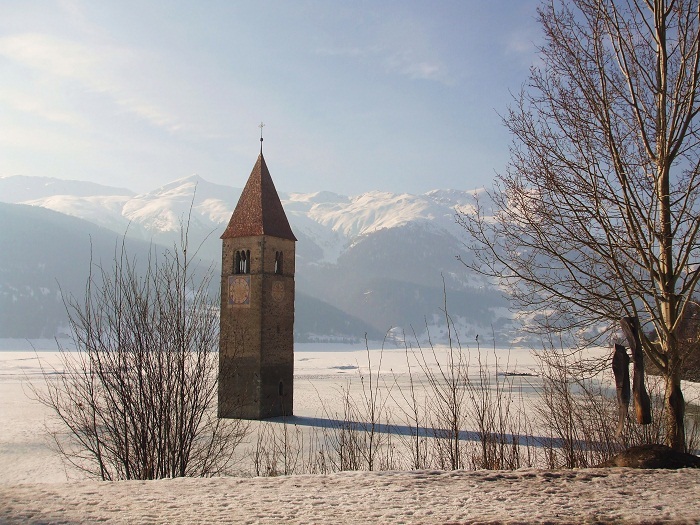 In winter too, when the lake is freezing, some of them are walking on the ice to get as close as possible to the Bell Tower. 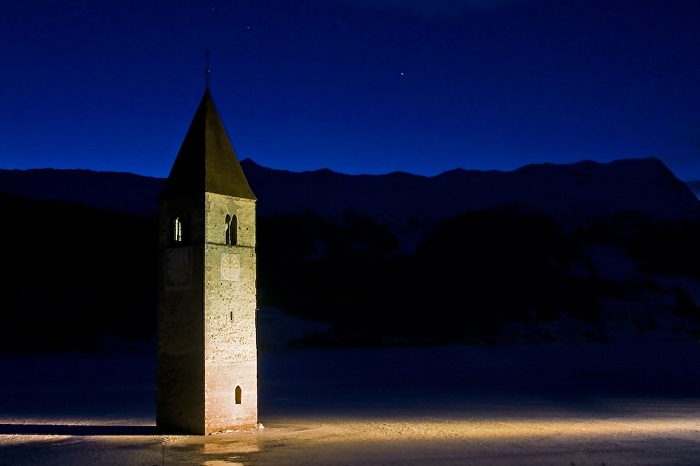 There are even local legends which say that people can hear the bells from within the tower ringing on cold nights, even though they have been removed. This very picturesque place will continue to take everyone’s breath away with every visit and will remind them about the simple life the villagers had here in the past.